The average yoga mat is about three to four millimeters thick. While different types of yoga don't require a change in the thickness of your mat, there are benefits to having certain sizes. Yoga mats vary in thickness for the purposes of function and comfort. Travel - At 1.5 mm, travel mats are the lightest types, made to be flexible and foldable so that they fit into a backpack or a small suitcase without adding too much weight. Because they are so thin, they are not ideal for use directly on hard flooring. Rather, they can be placed on soft flooring, such as a carpet, or on top of another yoga mat. Traditional - The traditional yoga mat ranges from three to four millimeters, depending on the manufacturer. Created to provide light cushion and decent grip, this option works for most. Pro or Premium - Premium style mats are extra thick. They span from five to six millimeters and are made to protect sensitive joints, such as your knees and elbows. Each mat also varies in the amount of grip it has, depending on the brand and materials it is made of, so you have a plethora of options to choose from. 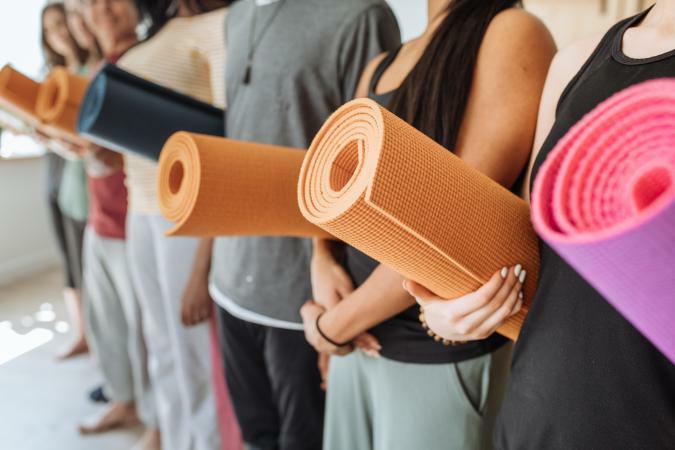 While thickness isn't used to pair mats with certain styles of yoga, there are a few types of exercise mats or flooring that some classes might utilize. Some AcroYoga classes, a form of partner yoga, are led on padded flooring. In fact, these classes usually take place at a cheerleading gym or dojo for martial arts, to help keep participants injury-free in the case that they fall. Some don't require a mat at all while others will have you place your mat on top of the padded floor. Fitness-based yoga classes sometimes opt for pilates mats. In these sessions, more time is spent on the floor performing exercises like pushups, glute bridges, crunches, and other core work. Unfortunately, these mats are not ideal for a standard yoga class. They tend to be squishy, so they don't provide adequate stability for standing postures. While yoga mats vary in thickness, there are no hard and fast rules on which ones to use for particular classes. You may find that you prefer to use a thick mat so that you have some extra padding between your joints and the floor. A good way to figure out what works best is to borrow a mat from a friend or rent one when you attend your next class.